Even though oysters are good to eat year-round—not just in months ending in “r”—today is the traditional start of oyster season. Here, the best ways to celebrate our favorite mollusk of all time. Even though oyster farming means oysters are good to eat year-round—not just in months ending in “r”—today is the traditional start of oyster season. Here, the best ways to celebrate the our favorite mollusk of all time. 1. Visit the country’s best oyster bars. The first thing to do is head to the pros. F&W’s list of the 22 greatest oyster bars in America is a good place to start. 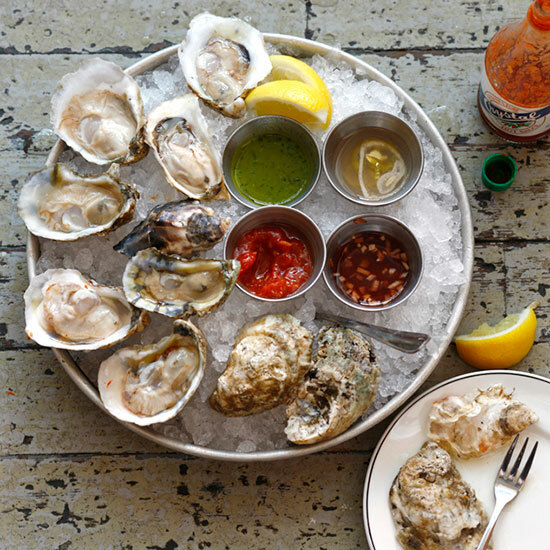 Our picks range from regional spots that specialize in local oysters, like San Francisco’s Hog Island Oyster Bar, to bars that feature a wide selection from both coasts, like April Bloomfield’s John Dory Oyster Bar in New York City. If you’ve never had an oyster stout before, we understand why you might be wary. But the classic British beer, which is brewed with fresh oysters, is minerally and pleasantly briny—not fishy at all. Try Harpoon’s Island Creek Oyster Stout, made with locally harvested oysters or Flying Dog’s Pearl Necklace Oyster Stout, brewed with Rappahannock River oysters. The way to truly appreciate an oyster is to shuck it yourself. This takes some practice, but once you master it, shucking is a breeze. In this video, master chef Jacques Pépin teaches you how to do it right. 4. Make these delicious oyster recipes. Whether you like them raw on the half shell, baked with cheese or in a chowder, F&W has the ideal oyster recipe for you. It's the best wine to pair with oysters (though they're also delicious with other high-acid whites, like Albariño and Champagne). A few of our favorite Muscadet producers include Domaine Luneau-Papin, Domaine de la Pépière and Domaine de la Louvetrie.